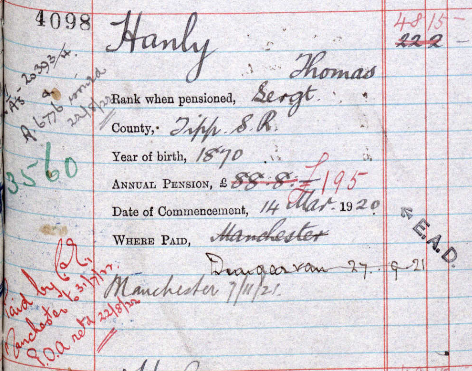 Thomas Hanly, a native of south Tipperary, was a constable in the RIC in 1901 and we first come across him as a census enumerator in Ardmore in 1901. His family lived in a house in Farrengarret in 1901 - this house may be what is now known as Murphys Cottage on Main Street (http://thememorytrail.com/place/2992). A search of the RIC pension records finds a possible match for Constable Hanly. If we have the right chap, he retired as a sergeant on 14 Mar 1920 (in the height of the War of Independence). His first pension payments were made in Dungarvan and subsequent payments were made in Manchester.